Kenworth presents at the Advanced Clean Transportation (ACT) Expo its latest prototype T680 semi tractor that is capable of driving 30 miles (48 km) on battery power alone. The truck is equipped with a parallel hybrid electric propulsion system with a lithium-ion battery pack that enables zero-emissions driving. It's not known when Kenworth intends to introduce plug-in hybrid or all-electric vehicles on the market, but clearly the time is near. 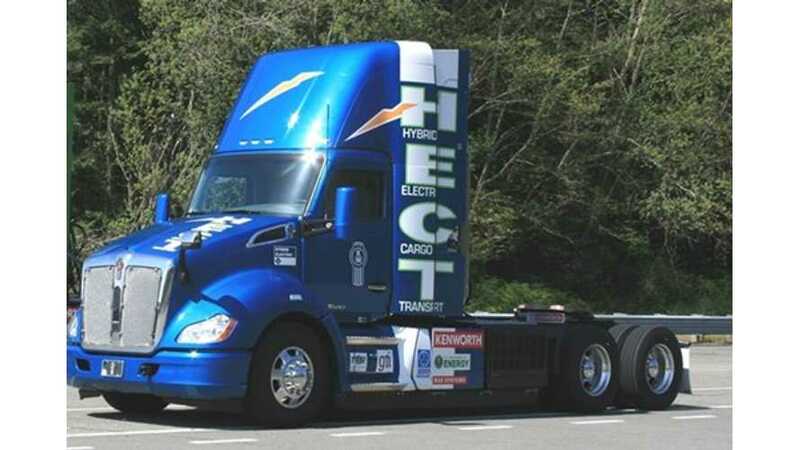 "The special Kenworth T680 vehicle is part of the Hybrid Emission Cargo Transport (HECT) demonstration project. The HECT project is funded in part by the Office of Energy Efficiency and Renewable Energy (EERE), the U.S. Department of Energy and the South Coast Air Quality Management District. The T680 HECT truck uses the Cummins Westport ISL G Near Zero (NZ) emission engine fueled by compressed natural gas (CNG), in combination with a generator to extend the truck’s battery range. The truck has a 30-mile zero emissions range using the electricity stored in the lithium-ion batteries. When the batteries are depleted, the near-zero emission engine turns on to generate more energy and extend the truck’s range up to 250 miles. Kenworth’s partner in developing the truck’s parallel hybrid electric propulsion system is BAE Systems. The system’s energy management and control capabilities ensure that energy generated by the engine and regenerative braking system is appropriately distributed through the dual-rotor electric motor, resulting in lower fuel consumption." 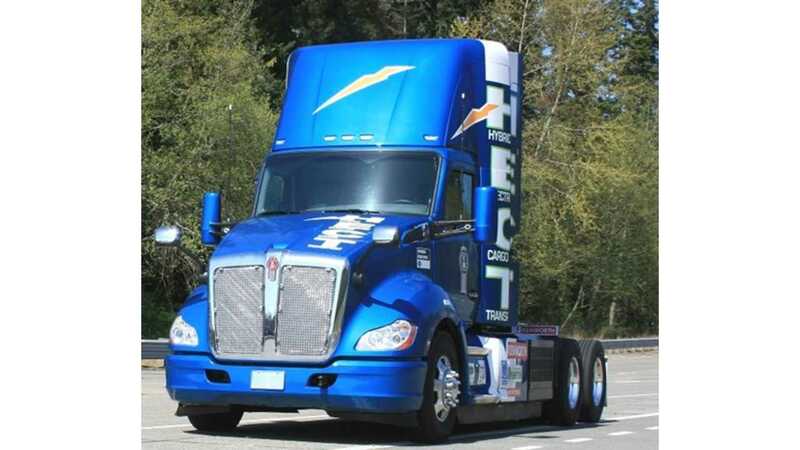 Earlier, Kenworth presented its Zero Emission Cargo Transport (ZECT) - T680 prototype with a 100 kWh lithium-ion battery and a hydrogen fuel cell range-extender. The range of ZETC was 150 miles (240 km).